What’s it like to stand with the Boca Juniors fans at La Bombonera? Freelance sports journalist Chris Marshall-Bell (@cmbell310) tells us exactly what it’s like to worship among Los Xeneizes’ congregation. The Brazilian opposition come out to train, booed and jeered like the encroaching villains they are – each player the target of fans extending their elbows back and forth repeatedly, whilst simultaneously shouting abuse and inflammatory insults, doing their best to intimidate. It’s like a children’s ball pit with half the kids are sucked under the surface, with only stray heads and arms bobbing above. Fans who are above the plimsoll line kiss one another. 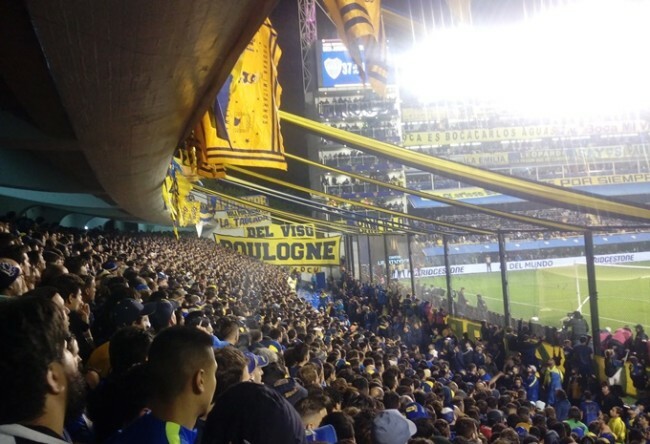 SUPERCLASICO SPECIAL: WHAT’S IT ACTUALLY LIKE TO WATCH A BOCA JUNIORS MATCH?